Stores reference 6D/105. The cloth is generally in very good and reasonably clean condition. Unusually there is remarkably little moth damage - this being confined to a couple of small holes on either side of the 'nose' seam and another on the upper edge of the right side as worn. Other than these there are only tiny holes/nips. More notable than the moth damage is a frayed 'cut' to the left of the nose (as worn). This extends to approximately 3cm but is NOT moth damage and there is no real loss of material. It looks worse because of the frayed ends but these could be removed, tucked inside or the cut repaired - please note that we have made no attempt to hide this or tuck away the frayed edges in the photographs shown here. None of these issues are too serious though and do not detract greatly from the overall appearance of the mask. 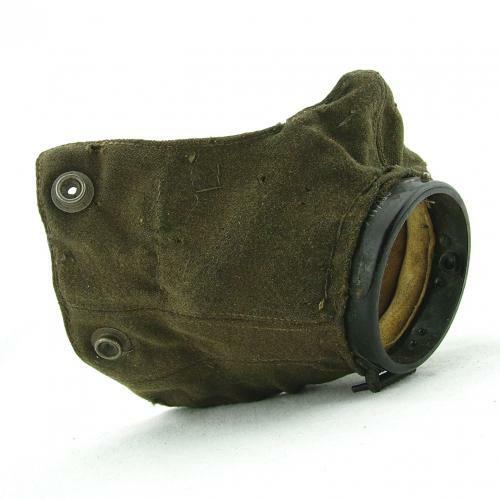 The 'flexible' flat solder 'bar' used to shape the nose of the mask to the wearer's face also appears to be intact/complete. The chamois lining is quite heavily soiled/rubbed through use and has a few small wear holes. The mask has been fitted with directly attached press studs rather than 'face protector' strips. The microphone mounting ring is in very good condition and complete with reference number stamped into the metal. Not fitted with a microphone or wiring but these can be supplied at extra cost if required. The overall shape of the mask is excellent and ideal for display. These have never been easy to locate and those found in recent years often have serious moth damage and clumsy repairs using glue and cloth 'fluff'. This could be one of the last opportunities to obtain a good example of what is considered the Holy Grail for many collectors. Stock code O21663.